The factory-applied oleophobic coating that most modern smart phones have on their screens wears off sooner or later. After that the screen does not feel so slippery and finger prints and greasy streaks are much more difficult to wipe off. My current phone is a Galaxy Note 8 and the nice oleophobic coating that it had when new started wearing off in the centre region of the screen after about 6 months of use. (I keep the phone in my front pocket and I much prefer it without a screen protector). I researched various products and read lots of reviews on forums etc regarding how to rejuvenate the coating. I tried other products such as Rain-X, and various types of car waxes and polishes. All of them did work a bit and for short periods. Finally I decided to try a Japanese product called "Fusso Smart Phone". This product had received mixed reviews although more positive than negative. One of the criticisms was that it did not come with instructions. Well actually it does have instructions on the box although the text is in Japanese. ① Wipe off the dirt on the tempered glass surface well with the included cleaning cloth before use. ③ Please dry again immediately . (I omitted this step. You don't want to polish the material off before it has had a chance to react with the glass surface). ② Please repeat 2 to 3 times. It takes 8 to 12 hours for fluorine to bond with the glass at the molecular level. It is desirable to leave it for 8 to 12 hours after coating. ※ Because the temperature is low in winter, please take longer leave time. If the work of 2 ~ 3 is carried out several times in several days, the water repellent effect will be further enhanced. Coating Solution: Main Component: Fluorinated Solvent, Fluorocarbon Compound. Cleaning cloth: Material: 70% polyester, 30% nylon. 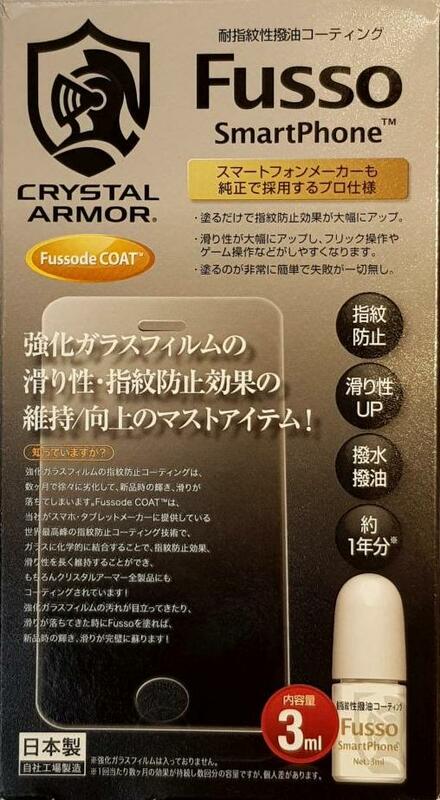 I applied about 15 drops of Fusso to the screen of my phone and spread it with the edge of a credit card. The solvent dries off very fast so get it spread before it has completely dried and then repeat. Leave it sitting overnight and then use the phone in the normal way for the rest of the day. I repeated the above procedure for a second time and again left the phone overnight. I repeated whole procedure for a third time. After polishing with the supplied microfibre cloth the screen was really nice and slippery and definitely very oleophobic (and also hydrophobic by the way). After 10 days the screen is still oleophobic and I can say that this stuff works much better than anything else that I have tried. There is still no re-appearance of the original worn patch on the phone screen. I will report again in a week or two. After 3 weeks the treated screen is still good. This product has already proved its worth to me. Even if I had to re-apply it every 3 weeks then that is what I would do. However it looks like being better than that. It is now 1 month after applying the treatment to my phone screen and it is still good. I am wondering why some people have reported poor results. It could be that the instructions are misleading in that one of the steps says to "Please dry again immediately". I did not do that and I have now added a note about that in the instructions above.